If you are in a good mood, there is always a reason to celebrate! That is what the tireless entertainers and cheerful stunners, who amuse Faeo residents with their performances think. 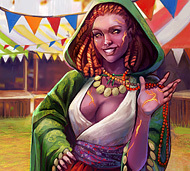 The beautiful Nadilarie, who cannot stand the boredom and dismay, and the cheerful Sheamus, a man, who exchanged his satisfied life for the chainless travels with the troop tradesmen, decided to cheer up the residents of Ogriy and Khair with the exciting event – Carnival! For such event to happen you will need a huge amount of various masks. Where can one get so many materials to make them? You need to help Nadilarie and Sheamus – they will tell you where to find these parts. You won't be able to complete their tasks alone though! Communicate with your friends, exchange information, help the newbies... In the end, carnival is held for friendly communication. As a reawrd you will be generously rewarded - you will be able to choose one of the bright masks for yourself, that was created with your help. However, even when you receive deserved reward don't rest. Continue collecting required resources and receive small souvenir masks. In the curiousity shop you will be able to exchange them for Sack of Red Axes Emblems and Sack of Gems. First contains 15 Red Axes symbols, second - 50 rainbow stones. Remaining masks can be exchanged for great memorable gifts. 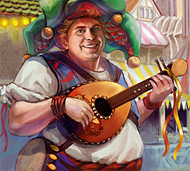 The fate of the Carnival is in your hands! in the «current events» tab.